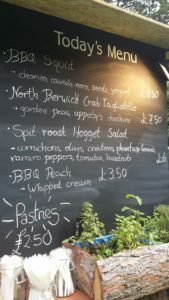 Even though our site has pretty comprehensive coverage of Edinburgh lunching and dining options, there are places that we’ve notably missed on the way. One of those is Gardener’s Cottage. We did visit in its early days but I couldn’t get to grips with the reverberating dining space, the quality of the cooking was ‎significantly lower than the quality of the ingredients, and I basically haven’t mustered the enthusiasm to return. When I heard that they were doing a ten-course menu for £120 in a VIP pop-up venue in George Square gardens, this Festival, it didn’t sounded like comfortably the worst idea I’d heard in a while. What I hadn’t heard was that part of the kitchen for that pop-up would be trading throughout August in the Udderbelly ‎garden. Intermingled with some fairly mediocre stalls from Laughing Stock, I stopped by to see what was what. Their menu is not your average Festival food stall selection. I’m not sure a BBQ baked peach is available anywhere else. They looked delicious. 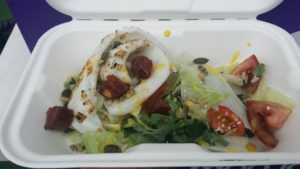 I was hooked in by talk of BBQ squid with chorizo, cavalo Nero, and mixed seeds (£6.50). ‎The item was cooked to order while I outlined my views on the neighbouring stalls to the friendly counter woman. The squid was soon with me having been smartly dressed by the chef. I strode off to find a suitable spot for munching only to be chased across the grounds by the counter woman with a little tub of chorizo that they’d forgotten to top the dish with. It was a really very charming moment. This was an outstandingly good dish with two large and beautifully cooked pieces of lightly smoky squid, fresh greenery and dressing, delicious tomatoes, and suitably oily goodness from the chorizo. The seeds brought excellent textural crunch elevating this from very good to exceptional. It was a superb dish. So overall, there was no sense in which I saw “something nasty in the woodshed,” in Stella Gibbons style. Instead I was glad to find it on excellent form. I’m unlikely to ever love their main restaurant but I very much enjoyed this fresh and well-balanced dish. 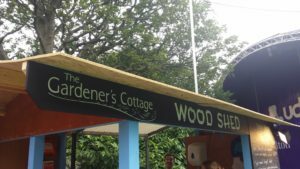 Make sure to visit The Gardener’s Cottage Wood Shed at your earliest convenient opportunity to sample this brilliant showcase of our local larder.